Give a restaurant a Michelin star and you will arouse the curiosity of some epicureans. 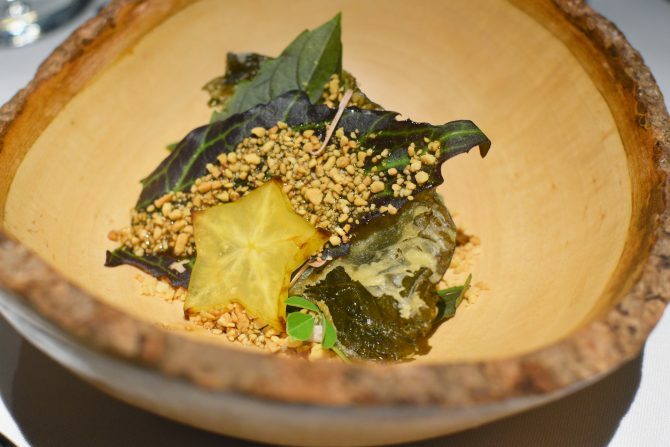 But for one Michelin-starred Labyrinth, we are way past its starry achievements to revere the inventive and envelope-pushing modern Singaporean food that, at the same time, champions produce sourced from local markets and farms. 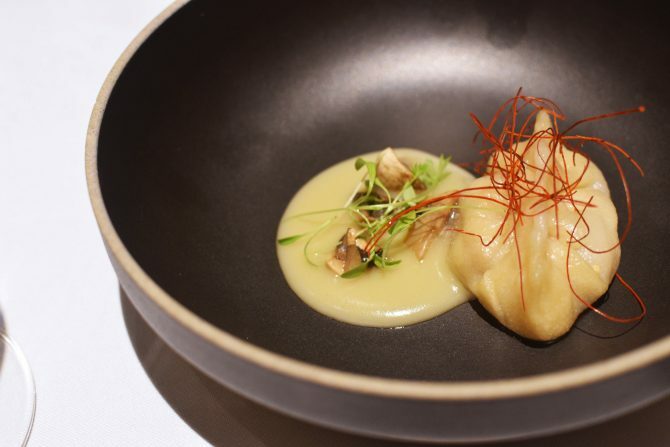 ‘New Expression of Singapore Cuisine’ – that’s what Labyrinth is calling this refreshed culinary vision. While seemingly rather superfluous, the new concept is basically giving local hawker food polished makeovers, while using local produce as a way to honour Singapore’s eco-system of farmers. We’re talking at least 80% of local produce that ranges seafood treasures from Jurong Fishery Port and dairy from Hay Dairies to sauces and honey from Kwong Woh Hing sauce factory and Stingless Honey Bee Farm respectively. Part of this direction also stems from chef-owner Han Li Guang’s memories of his grandmother’s cooking. From its four-course lunch tasting or pre-theatre menu ($68 per pax), and 10-course ‘Experience’ dinner tasting menu ($178 per pax), you get to savour these re-interpretative local dishes, such as oolong tea-infused quail eggs to reflect the traditional Tea Egg, and the delicious absurdity of “Nasi Lemak” Cheong Fun – coconut rice skin that wraps sambal and egg yolk, before topped with deep-fried chicken skin, ikan billis and cucumber. While dishes may be imaginative, Chef Han still manages to cast his reins over his unbridled culinary creativity to ensure the renditions meet the taste quality that gave the restaurant its one Michelin star standing. The perfect star model of this statement is the zesty-sweet Labyrinth Rojak, featuring 12 different herbs from Edible Garden City that is tossed in honey, and served with a cempedak and jackfruit sorbet. A fistful of ground nuts is thrown into the mix, a welcome addition that not only keeps close to the Indian classic, but also gives texture to the entirety. Hot on its heels is the Heartland Waffle, where pandan waffles are slathered with local duck liver, cooked with garlic, shallots and Shaoxing wine, and sweet goji berry jam. Like enjoying duck liver smeared on a piece of water biscuit, the latter offers what the cheeseboard’s member lacks – nostalgia, further sweetened by the goji berry jam. Another standout is the “Ang Moh” Chicken Rice. Like the earlier “Nasi Lemak” Cheong Fun, this dish’s rice aspect is the dumpling skin, made from rice flour, that encases diced chicken folded into ginger sauce and sesame oil, alongside Chef Han’s secret chilli sauce recipe. Elsewhere, Chef’s famous chilli crab ice cream makes a return by plopping on slippery egg white ribbons, served with steamed flower crabs. For more substantial mains, there are the charcoal-grilled Indonesian Pork Collar, Nippon Koi Farm Silver Perch featuring textures of black garlic, and Toh Thye San Farm Poulet ($10 Supplement) of Cantonese style roast chicken breast, and a chicken roulade stuffed with glutinous rice. 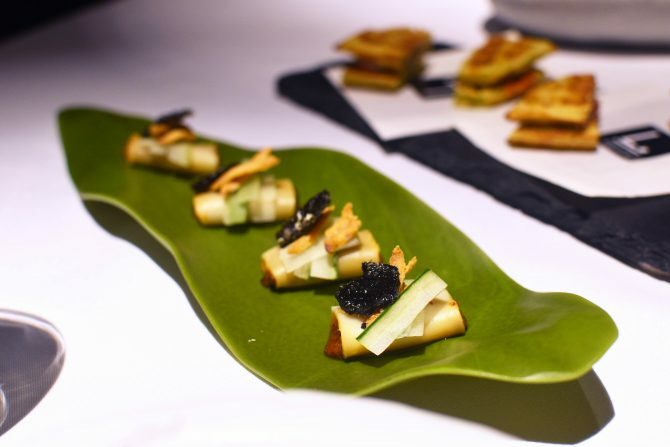 Chef Han then hits close to home with the sweet ending of Cristal de chine Caviar…which is basically a polished reinterpretation of the kaya toast. 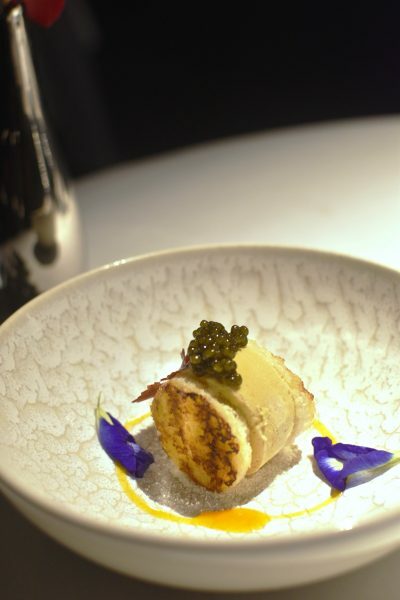 Sandwich between old-school toasts is a drum of kaya ice cream, made from palm sugar, pandan leaves and coconut cream, that is then adorned with a dollop of caviar. The kaya toast dessert is enjoyed with an egg yolk sauce cured with light soy sauce, just like how you would the traditional offering is eaten with soft boiled eggs. So with or without a star, Labyrinth, and its successful attempt of making hawker favourites fine-r with the use of local produce, is one homegrown product that we, as Singaporeans, can be proud of.